Some people are born public speakers. To them, it comes naturally to be charismatic and talented at making points clear and precise. For others, however, the prospect of heading a meeting to pitch ideas – especially if they require further funding – can be downright frightening. Preparation, a feeling of knowing materials backward and forward, and a familiarity with your audience will make a huge difference in a successful presentation. Follow these steps to conduct a smooth business presentation. Nothing will make your pitch meeting run more smoothly than preparation. Gather the right materials and learn everything about them. Supporting material is important to your credibility and making your point. Pro tip: images such as infographics will keep your audience more engaged than a surplus of spreadsheets. Even the most meticulous of people don’t enjoy looking at multiple spreadsheets and graphs in a presentation. If you’re presenting to a group of your close colleagues, you may not need much preparation, but if you are less familiar with your audience, it’s a good idea to learn all you can about them. This will help you feel more comfortable when presenting and will also give you an idea of the tone and delivery methods you should adopt. Presentations should be a communication tool. Be comfortable and casual. Tell stories. Don’t make anyone figure out your key points, tell them directly. Pay attention to body language and be receptive of how your audience is reacting to and absorbing the information you are giving. If they seem less than receptive, don’t be afraid to encourage them to give their opinions. After you have given your presentation, highlight clear takeaways. Discuss your main points again and present your argument or proposal. Your audience should leave with action steps or a plan of action – even if it isn’t directly involving their participation. Forbes.com advises presenters to be prepared for difficult questions, especially ones that, “…derail your presentation or subvert your goal.” If no one asks questions, have your own prepared to make sure everyone involved is clear about the topic and how to move forward. These can be questions you ask the audience about how they feel or common questions you think should be addressed. Earle Brown is a great place to conduct a business meeting of any kind. Whether you’re pitching a new idea, revamping the budget, or proposing a new plan, the spaces you’ll find at Earle Brown are more than accommodating. To book a meeting room, check out the options at Earlebrown.com. Earle Brown is a great place to conduct a business meeting of any kind. 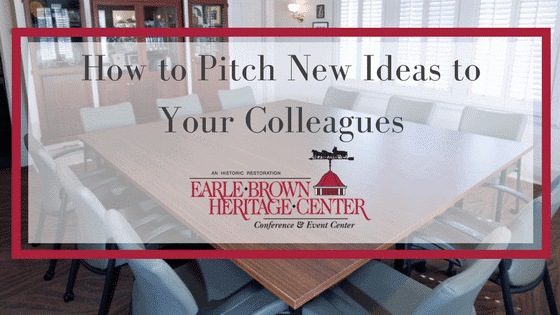 Whether you’re pitching a new idea, revamping the budget, or proposing a new plan, the spaces you’ll find at Earle Brown are more than accommodating.